For example, with A = “abcd” and B = “cdabcdab”. Return 3, because by repeating A three times (“abcdabcdabcd”), B is a substring of it; and B is not a substring of A repeated two times (“abcdabcd”). The length of A and B will be between 1 and 10000. Imagine we wrote S = A+A+A+…. If B is to be a substring of S, we only need to check whether some S[0:], S[1:], …, S[len(A) – 1:] starts with B, as S is long enough to contain B, and S has period at most len(A). Now, suppose q is the least number for which len(B) <= len(A * q). We only need to check whether B is a substring of A * q or A * (q+1). If we try k < q, then B has larger length than A * q and therefore can’t be a substring. When k = q+1, A * k is already big enough to try all positions for B; namely, A[i:i+len(B)] == B for i = 0, 1, …, len(A) – 1.
len(B) <= len(A*q)，只需要查看B是否为 A * q 或者A * (q+1)的字串。因为如果尝试的k<q，那么不够长。当k=q+1的时候，A*k已经足够长来包括所有的B了， A[i:i+len(B)] == B for i = 0, 1, …, len(A) – 1. Note: The length of path between two nodes is represented by the number of edges between them. Note: The given binary tree has not more than 10000 nodes. The height of the tree is not more than 1000. On an NxN chessboard, a knight starts at the r-th row and c-th column and attempts to make exactly Kmoves. The rows and columns are 0 indexed, so the top-left square is (0, 0), and the bottom-right square is (N-1, N-1). A chess knight has 8 possible moves it can make, as illustrated below. Each move is two squares in a cardinal direction, then one square in an orthogonal direction. Each time the knight is to move, it chooses one of eight possible moves uniformly at random (even if the piece would go off the chessboard) and moves there. The knight continues moving until it has made exactly K moves or has moved off the chessboard. Return the probability that the knight remains on the board after it has stopped moving. 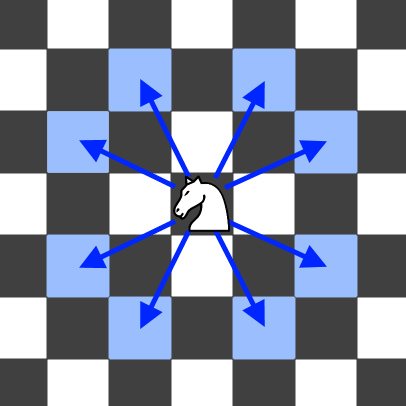 Explanation: There are two moves (to (1,2), (2,1)) that will keep the knight on the board. From each of those positions, there are also two moves that will keep the knight on the board. The total probability the knight stays on the board is 0.0625. N will be between 1 and 25. K will be between 0 and 100. The knight always initially starts on the board.